We offer more aesthetically pleasing white fillings. Up until recently, amalgam was the only filling material that could stand up to the wear and tear forces experienced at the back of the mouth but advances in technology have meant that tooth coloured alternatives are now available with similar durability and the advantage of superior aesthetics. ABOVE: The gel (hydrogen peroxide) penetrates the enamel to reach the discoloured molecules in the tooth, oxygen molecules then react with the discoloured molecules, breaking the bonds that hold them together. The oxygen molecules spread whitening the entire tooth. Tooth whitening is the No.1 requested and performed cosmetic dental procedure in the UK. In everyday life the microscopic pores of your teeth are pigmented with substances such as red wine, coffee and tobacco. These, in conjunction with age related changes gives your smile a stained and discoloured appearance. Tooth whitening lightens teeth and helps to remove stains and discolouration. Teeth whitening is available as in-surgery and home treatments and can brighten your teeth by several shades, giving you a whiter, healthier-looking smile. We use a variety of the latest whitening systems and we have a special whitening consultation to tailor fit the treatment to your needs and expectations. Orthodontics can be a treatment choice for people of all ages not just children.Orthodontics involves correcting teeth that are badly positioned, crooked or overcrowded, as well as closing gaps between teeth and correcting bites. This is done using orthodontic braces which move the teeth into the correct positions and alignment. Today there are more aesthetic braces which is making orthodontics increasingly popular, particularly for adult patients. More and more adults as well as children receive orthodontic treatment to improve their smiles, although a better appearance is certainly not the only benefit of treatment. Correcting the alignment of your teeth not only optimises the bite and functional arrangement of your teeth, but also facilitates easier brushing and flossing, helping you to keep your teeth healthy. 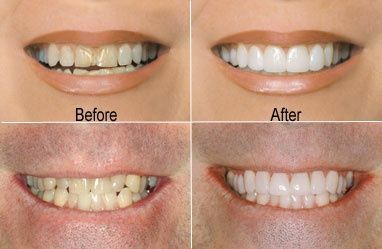 Veneers can be used to transform smiles. They can be used to repair chipped teeth, to visually correct the appearance of misaligned teeth, or to simply mask and improve the shape, size and colour of your teeth. We offer a range of porcelain veneers, including Lumineers which are veneers as thin as contact lenses that can be fitted without any injections or drilling. 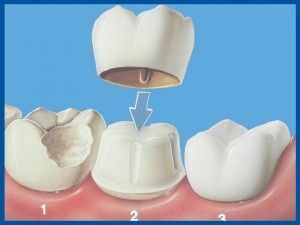 ABOVE: 1-Broken tooth, 2-Prepared for Crown, 3-Crown Fitted. Crowns are the ideal restoration for teeth which have been broken or weakened by decay or very large fillings. The crown fits over the remaining part of the tooth, making it strong and giving it the shape and contour of a natural tooth. Crowns are sometimes also known as 'caps' and can be made from porcelain, gold or a combination of these two materials. 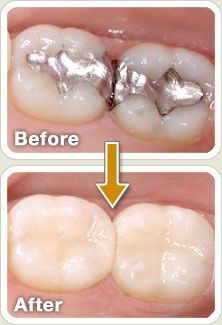 • Porcelain bonded to precious metal: This is what the majority of crowns are made from. A precious metal base is made and porcelain is then applied in layers over it. • Zirconia Porcelain Crowns (e.g. Lava, Procera): These porcelain crowns offer the best of both worlds, combining high strength and unrivalled aesthetics and are suitable for all areas of the mouth. Bridges are a fixed restoration that is fitted when a tooth or teeth are missing. It provides a false tooth, fixed in position by attaching it to an adjacent tooth or teeth. There are two types of Bridges, bonded and Maryland. Bonded require the adjacent tooth or teeth to be prepared similar to how a tooth is prepared for a crown. The bridge then consists of 'linked' crowns, holding the false tooth in place. This type of bridge is strong, but disadvantages include having to prepare the adjacent teeth and long term cleaning. Maryland bridges consist of a false tooth held in the gap by cementing an attached metal plate to the back of an adjacent tooth. The advantage is that this adjacent tooth does not need to be prepared and trimmed down. The main disadvantage is strength, they usually do not last as long as bonded bridges.